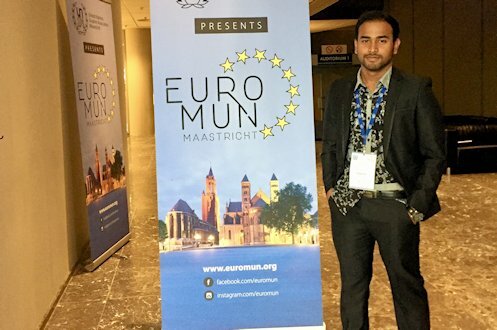 UII student, Zul Hazmi Lutfi, won Best Diplomacy Award at the European Model United Nation (EuroMUN) 2018 event, held in Maastricht, Netherlands. 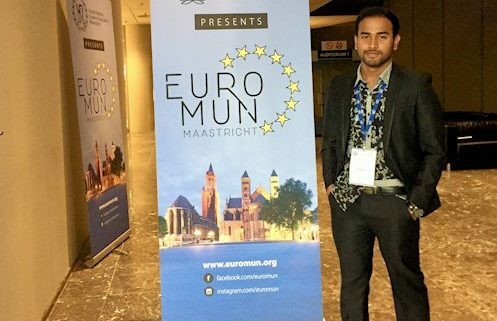 Zul Hazmi become one of delegates in one of the most competitive MUN in Europe. The participant is strictly selected by the committee. This year, EuroMUN took the theme, “Shaping the Future from The Heart of Europe”. During MUN’s activities, Zul had the opportunity to represent Myanmar in the United Nations High Commissioner for Refugee (UNHCR). The first topic of discussion is, “Expanding the scope and capacity of the 1951 refugee convention” and the second is “The evaluation of refugee camps”. 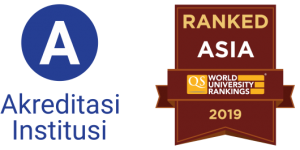 Zul Hazmi did not expect to bring such award when returning to Indonesia. “Really I did not expect it, because I am listed in a committee filled by prominent delegates. And certainly, I am very grateful because my effort to come a long way to Europe has become a success, “he said. The total number of participants is 500 delegates. The Indonesian delegation come from various universities, such as Universitas Indonesia, Universitas Gadjah Mada, Universitas Brawijaya, and Universitas Islam Indonesia, as well as other delegates from all parts of Asia, Australia, Europe, Middle East and Africa. Prior to his participation in EuroMUN, Zul Hazmi admitted he have to struggle in preparation. Especially when his class schedule was very tight. According to him, the atmosphere in the EuroMUN event is full of sportsmanship and collaborative. “All the delegations show sportsmanship and collaborative attitude in the trial simulation process, the event organizers also built a warm atmosphere with our delegates as well as the head of the session,” added Zul, who is also a student in FTSP UII. When asked about the most memorable experience, Zul recalled when Rohingya crisis emerged as a topic of discussion. As a representative of Myanmar, he has to defend his country’s position and maintain the trust of his allies. Zul who is also part of the Board of Executive of UII MUN Association hopes that the association can get more attention and interest from UII students. According to him, UII MUN Association is an organization which encourage student’s ability to think critically and to express opinions in public. “It is more than just going abroad, but more importantly is diplomacy soft skill capabilities that can be obtained in the MUN conference,” he concluded.